Metal Detectible dB Blocker™ hearing protector devices are for industries such as food and pharmaceutical manufacturing. Our Metal Detectible dB Blockers™ have been tested by a wide range of metal detection equipment. Most hearing damage arises when an ear plug is removed for conversation and comfort. Metal Detectible dB Blockers™ are made to fit the individual’s ear exactly and stay in place without pressuring the ear so comfort is not an issue. This gives the worker a product that provides effective hearing protection and stays in the ear all day long. 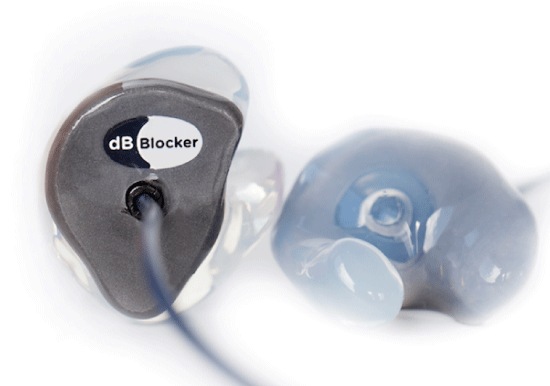 Using dB Blockers™ will enhance worker compliance with your Hearing Loss Prevention Program, because they can be worn for a complete shift without the need to remove them to perform tasks, eat lunch, or relieve pressure. Anytime a hearing protector is removed, even for a short period of time, you are exposed to damaging noise. Noise exposure is cumulative. As well, Metal Detectible dB Blocker™ ear pieces are permanently attached to the lanyard. Both protectors and the lanyard are detectible should they break or fall into the process. Cold temperatures will not make them brittle, and they are also heat resistant. These features provide workers with an efficient hearing protection device suitable for all food and pharmaceutical manufacturers and processors.